I want to be a regular. This may be aspirational, since it seems as though everyone also feels the same way. 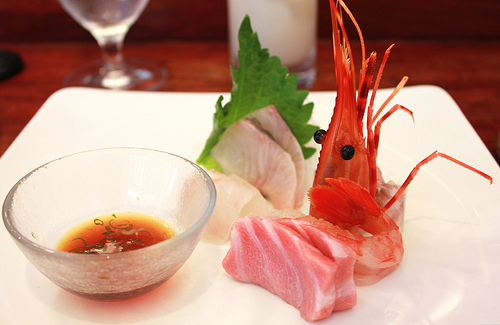 With one Michelin star under the belt, Kusakabe seems to churn out fans – not only with its high-quality fish but its natural and comforting service. 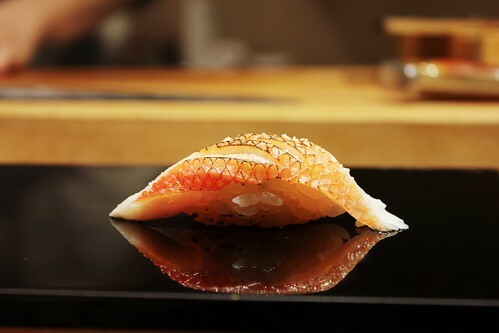 Nothing seems to be out of place, and all is harmonious with the extra focus on what’s most important – the fish. 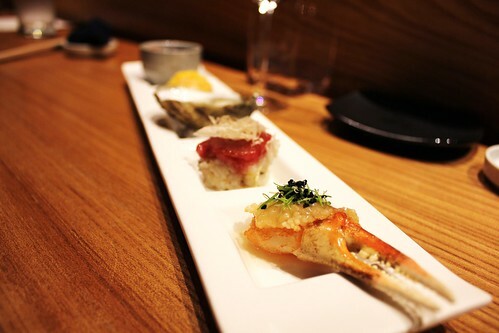 There is only one menu – the omakase (chef’s menu) – where eight central courses are all centered around fish, and several sushi pieces sewn throughout the meal. The first piece was a great opener and set the tone for the rest of the meal. 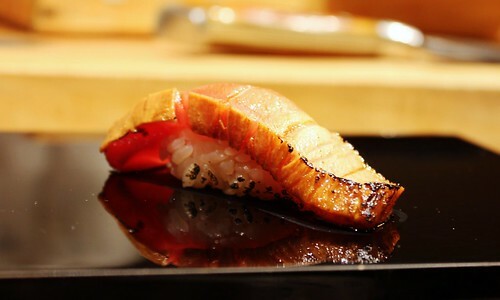 The Zuke Chutoro – a lightly seared bluefin medium fatty tuna cured in soy sauce – was awfully delicious. The tuna was flavorful; the saltiness from the soy with tuna melded harmoniously and ended with a faint char at the end. Chef Ken mentioned this was their signature piece, and I can totally understand why. 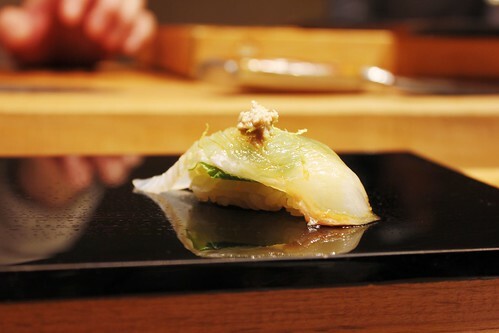 Unlike its previous counterpart, the hirame (fluke) served with shiso was light and refreshing. Nice way to follow the zuke chutoro. The katsuo (skipjack tuna) followed suit. 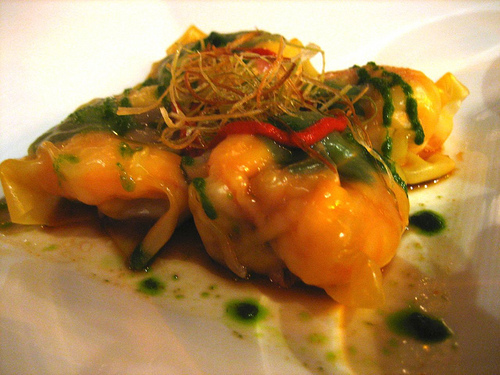 Served with some green onion, it was delicious as it encapsulated umami flavor. 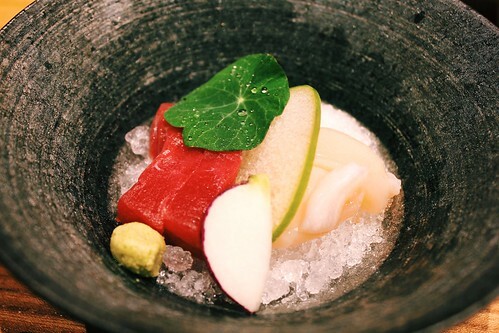 Tuna and hotate (scallop) sashimi served on top of shaved ice with fresh wasabi and yuzu onion sauce. Each piece was definitely very fresh. Surprisingly I also enjoyed eating the radish as it provided a complementary refreshing taste and crispy texture against the fish. 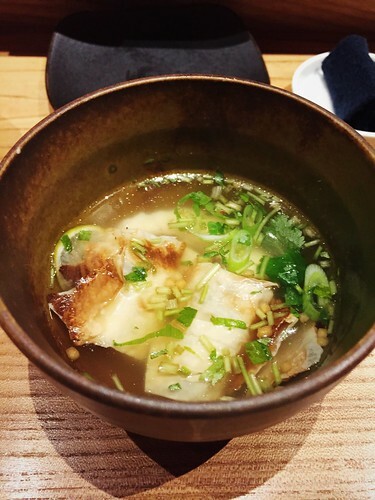 The Ushio-jiru (seafood soup) was made from Japanese tai snapper, and had somen noodles with fresh yuba. At first I wasn’t expecting much, but after the first slurp I was under a food trance. All I could keep doing was slurp to much of my pleasure. The soup had depth, with meshing umami and citrus flavors, and lightened with dashes of cilantro. The beautiful plate of the chef’s petit fours and a Shiguko oyster served with French Daurenki caviar well represents what’s in season. What I got was, not surprisingly, all very tasty – some examples include a shrimp with a dusting of freeze-dried egg yolk or a crab claw with a puffed rice cracker. 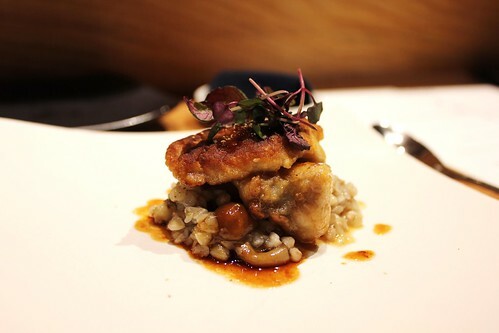 The Sansho Teriyaki Monkfish and its liver with “Soba” buckwheat and Nameko mushroom risotto was finely cooked. There wasn’t much risotto and I would say, mainly focused on the monkfish. Nothing wrong with that in my book! 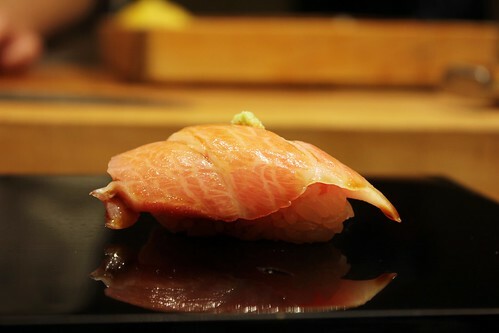 The shima aji (striped jack) was nice, with some good fattiness to it. 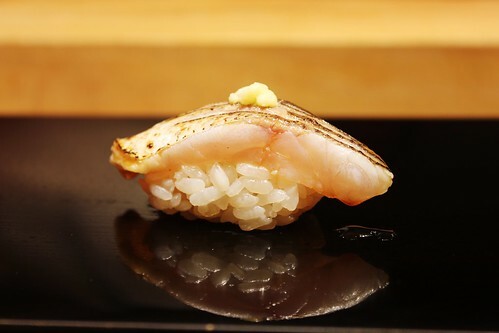 Kamasu (Japanese Barracuda) was so delicious too. It was lightly torched which brought out the light char flavor but went so well with the fish itself. 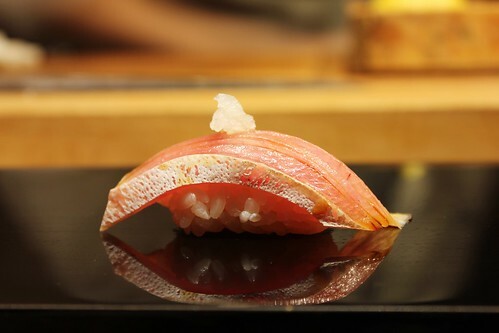 I easily gulped down the buri (yellowtail) – it was very fresh and had some good fattiness to it. Yum. 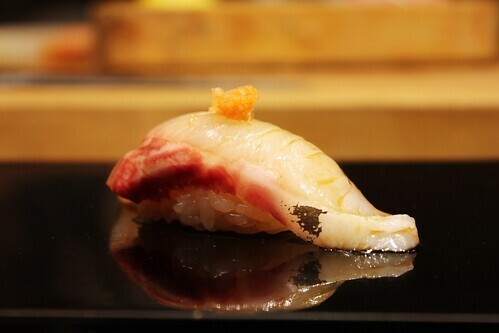 The omakase officially ends with your choice of toro or wagyu beef sushi, which I chose the former. You can never go wrong with toro (fatty tuna). After all, it’s meant to melt in your mouth and that it did. Obviously I couldn’t stop there so I ordered two more pieces to see what was on the a la carte menu. 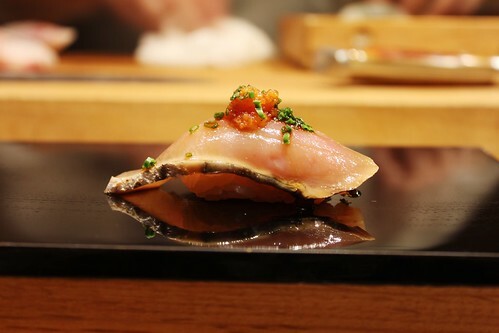 I decided to pick a piece where it required a bit of preparation versus being a fresh piece of fish, so this was the Ji Kinmedai (Golden Eye Snapper) that has been lightly smoked with cherry wood. It was delicious, though I think I tasted more of the smoke from the char than the cherry wood. 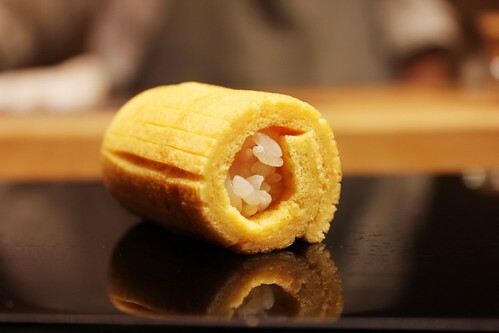 Last, but certainly one of the more memorable pieces of sushi to me, was the Gyoku. It was made from fresh lobster and organic eggs. 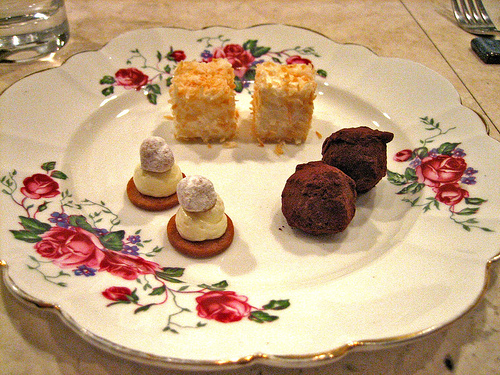 Essentially it was a fluffy egg cake, and provided a perfect sweet savory ending to the meal. I found my entire meal to be nicely paced. 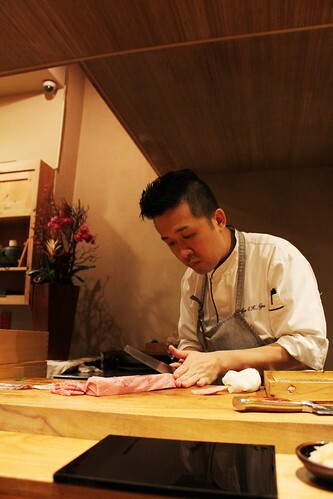 Chef Ken was incredible and knowledgeable about his craft and fish. 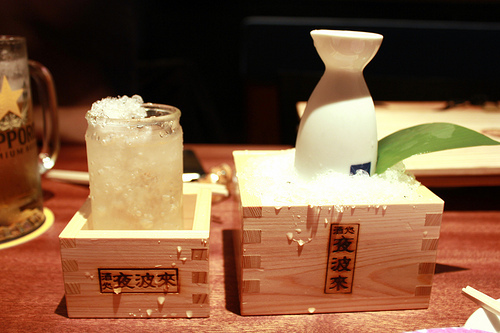 Nothing there felt pretentious and just a restaurant that aims to serve delicious sushi and dishes. 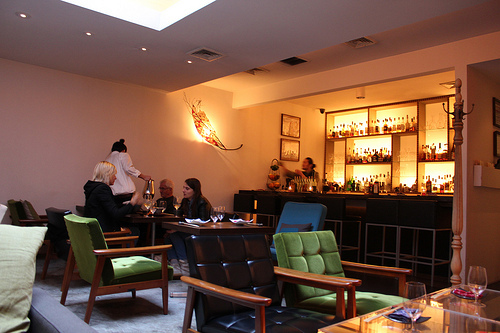 Good thing I’ve already made my next reservation.